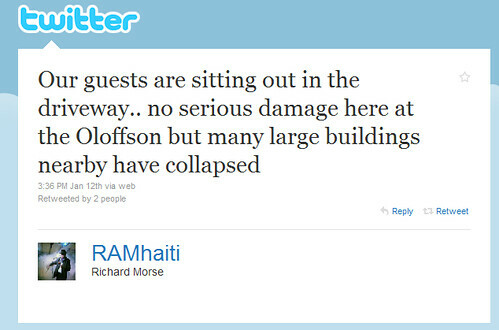 In January, after the Haiti Earthquake struck, if you were participating on social networks, you couldn’t help but notice the many, many Tweets and Facebook status messages about the Haiti Earthquake. The messages included pleas for support or retweeting the news, but beyond that the stream included pleas from people on the ground in Haiti asking for emergency assistance or letting loved ones and friends know they’re okay. A new American Red Cross survey shows many web users would turn to social media to seek help for themselves or others during emergencies—and they expect first responders to be listening. The online survey asked 1,058 adults about their use of social media sites in emergency situations. It found that if they needed help and couldn’t reach 9-1-1, one in five would try to contact responders through a digital means such as e-mail, websites or social media. If web users knew of someone else who needed help, 44 percent would ask other people in their social network to contact authorities, 35 percent would post a request for help directly on a response agency’s Facebook page and 28 percent would send a direct Twitter message to responders. 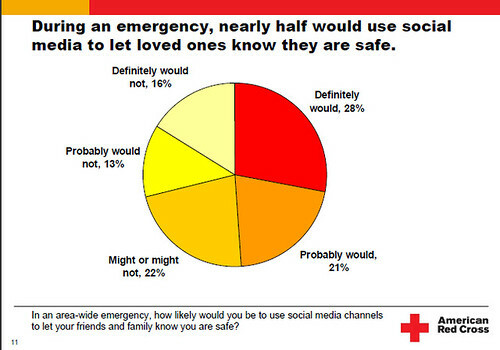 During an emergency, 41% of respondents would use social media to let their love ones know they are safe. Social media has radically changed how people communicate, including their calls for help. As we have seen in natural disasters from Hurricane Katrina to the Chile Earthquake, people are using social media to reach out for help. And they expect a response from emergency and disaster response organizations. To meet this growing challenge, the American Red Cross is launching an initiative to address how to reply to these digital cries for help more effectively. This ranges from online discussion of the issue to hosting an Emergency Social Data Summit – or #crisisdata on Twitter on Thursday August 12, 2010, in Washington, D.C., with government agencies, emergency management professionals, disaster response organizations, tech companies and concerned citizens. The Summit brings together emergency responders, government officials like the White House’s Macon Phillips, technologists like Robert Scoble and Christopher Penn and civilians like CrisisCommon’s Heather Blanchard to discuss exactly how to address these digital cries for help more effectively. Disclosure: My company Zoetica and more specifically my co-founders Geoff Livingston and Kami Huyse have been working with the Red Cross to develop a strategy for this summit for the past two months. Geoff Livingston has shared a post this morning from a personal perspective about why how social media is impacting emergency response, the compelling reason for the Emergency Data Summit. As Geoff describes in more detail, the Summit conversation will use established and more experimental social media tools and platforms to involve people who are not in the room in the discussion. This includes a a wiki, Twitter conversations during the conference via the #crisisdata hashtag, Flickr photos and U-Stream (to be provided by NextGenWeb). On the blogging side, while the main event page is on WordPress, Geoff will be using a posterous blog for updates about the conference and to publish early chapters of #crisisdata white paper. He will, of course, share his insights about the tool for this purpose. In addition to using Foursquare and Gowalla for conference attendees to check in and leave tips, the conference will also experiment with Whrrl, a geo location crowdsourced storytelling application. Conference attendees will be asked to download and join the Emergency Data Society. This will facilitate a self-organized, community scrapbook of the event from attendees. Again, expect a full report from Zoetica about how this worked as a tool as a back channel and documentation tool for the conference. I won’t be at the event in Washington, DC, but I’ll be participating via #crisisdata on Twitter and exploring Whrrl. Hope you will too. This also makes me think about the flipside–having social media be a part of an organization’s emergency/crisis communications plan & manual. Specifically, for location-based nonprofits (museums, theaters, etc.). Adding social media, e-mail, web updates (everything from messaging to log-ins) to the manual would be important. I look forward to see the results from the conference. Thanks Beth. In addition to the event’s actual content, this will be a major feat for the Red Cross – we’ve never offered wifi before. Doesn’t seem like a big deal but our IT department has jumped over about a million hurdles so people in the room can tweet and whrrl. The Hall of Service will never have seen so much real time online community activity in its long and storied history. Wish you could be here! Thank you for all of your support in this and many of our technological endeavors. Thanks as always, Beth. Following up on Jay’s comment – last autumn I wrote a post Blogging a crisis: reflecting on some lessons learned, which reflected on a ‘post-crisis’ blog (following Hurricane Wilma in October 2005) I co-authored – pre-Twitter. It would be done differently today, but I share some lessons I learned. It’s great the Red Cross is sponsoring this innovative Emergency Social Digital Summit. So much potential. I’ll be there via the twitter # and will figure out what Whrrl is! * I didn’t feel the earthquake. I found out about it via a message from someone in Africa 40 minutes after the event. * Twitter was the best source of information for everyone in the first minutes and hours. Our mainstream media only started serious coverage 2.5 hours after the event, and most of their information and photos for the first few hours came from posts on Twitter. Overseas media covered the situation before local media. Overseas outlets requested interviews with locals via Twitter. * Power cuts in the city disrupted radio and television broadcasts (and reception) but not social media. * Authorities lagged behind in adopting the social media protocols. See http://www.cats-pyjamas.net/2010/09/social-media-use-in-a-crisis-eqnz-which-hashtag-prevails/. By the way, the #eqnz hashtag was so widely adopted that it has become a colloquial term for the Christchurch earthquake. Good – I should certainly pronounce, impressed with your website. I had no trouble navigating through all tabs and related info ended up being truly easy to do to access. I recently found what I hoped for before you know it at all. Quite unusual. Is likely to appreciate it for those who add forums or something, site theme . a tones way for your customer to communicate. Excellent task..